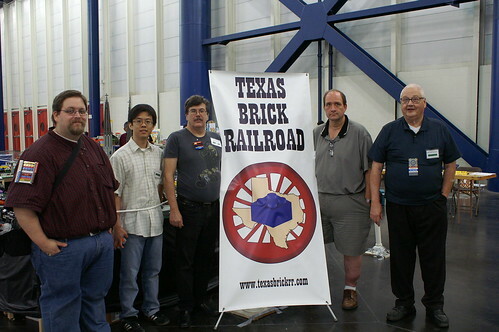 Here are some photos from last weekend, where Texas Brick Railroad (TBRR) displayed at the Big Texas Train Show in Houston, Texas. I think this was one of our best solo displays yet. Thanks for sharing. What an amazing lay-out. Many thanks for sharing! Beautiful work. The train station is simply incredible, as is the terrain around it. I can only dream of ever building or owning something like that. Thanks for sharing! Train crash looks realistic too. Were any ants hurt? Thanks for sharing. 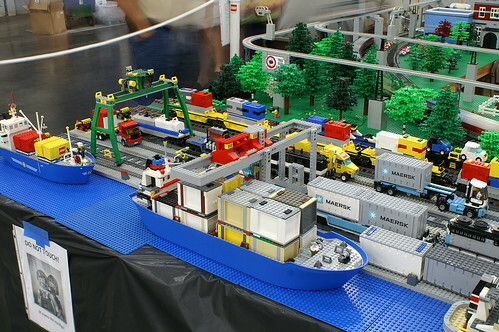 I love the harbor picture ...this section looks very busy with a real life scene of working activity! Excellent Work! The layout looks AWESOME! as usual. Thanks for sharing the images 'Sava'.....Brick On ! Looks Amazing! Is there plans for shows in Austin any time soon? Thanks all. 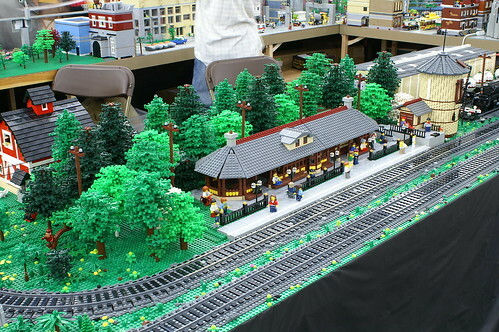 I don't know when our next show in Austin will be, though there's talk of putting together something for Brick Fiesta in Austin summer 2015. Our next displays will be Galveston, Texas City, and Orange, with the possibility of a display in New Braunfels mixed in there somewhere. We try to keep our website updated. I assume you guys are running PF trains on the plastic track? What do you do about batteries, just keep swapping them out? Does it become a problem in a continuously operating layout? Love the monorail and harbor. That cathedral is absolutely massive! Yes, we run batteries - I run PF Battery Boxes filled with Eneloop brand rechargeable batteries - they are awesome. 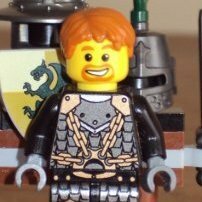 The rest of my club-mates use the LEGO rechargeable PF battery. Since we have many different sets of batteries to choose from, and even more locomotives, a single train running low on power is simply an excellent excuse to swap out trains and keeping it interesting for the club members and public alike (alone I have over 7 PF capable locomotives). And since Eneloop batteries and the rechargeable PF battery both provide constant output of power until the last few minutes of run-time, the trains never start slowing down or stalling through tight curves. They just kind of... suddenly die. 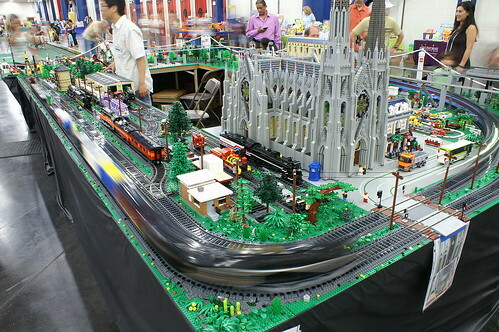 We don't usually run our trains at full speed (they tend to derail on standard LEGO curves at full speed), we can typically get about 2-3 hours of run time out of them running the AAA batteries. An average show will last about 8 hours a day, so that's only 3-4 trains worth of batteries, and we usually ask for an electrical drop to charge batteries as needed. At the last show, I ran my Allegheny at half-speed. It doesn't run on AAA batteries, but AAs, so with a higher capacity, and my not running it at full speed, it meant I got over 6 hours of run time in one day - it just kept chugging along. Regarding rail distance - we use the standard track placement - 4 studs from the edge of the baseplate, 8 studs between tracks. Nothing too fancy. The height of the rail is dictated by the type of track ballast we use, which is the PennLUG standard. It lifts the track two plates off the baseplate. 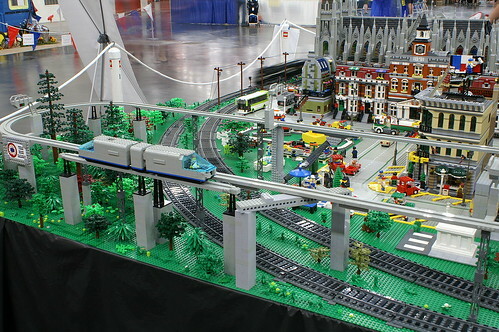 Our club standard height for elevated rail (monorail or otherwise) is 20 bricks baseplate to baseplate (track bed to track bed).